I was just browsing Etsy to see who else was selling sustainable products. I came across some fab finds that I wanted to share with you. 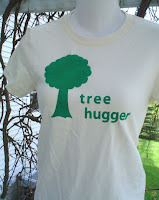 Supastarr makes this fresh organic cotton Tree Hugger Tee! Check out this adorable clutch from Stephie Lou, made from a vintage dress! 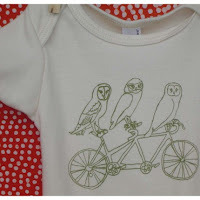 Here's an incredibly unique onesie for the baby in your life from RockPaperScissorsArt. This might be the cutest thing I have ever seen!